1. Flex Banner Printer also called eco solvent printer! The major media for flex banner printer is Flex banner and sign fabric that is a durable, flexible, translucent, dimensionally stable material with built-in dirt resistance. Flex banner made of laminated PVC plastic fabric and can be attached to a variety of frameworks after print by flex banner printer. The substrate has a polyester scrim embedded in a white-pigmented vinyl. The front surface is smooth and has a semi-gloss appearance that can absorb the eco solvent ink as well. The fabric can be categorized as frontlit and backlit based on the position of the light source. The physical property is slightly different. But both of them are used to print by flex banner printer. 2. Adhesive Vinyl Printer is also called poster printer or eco solvent printer! State-of-the-art printers aren’t the only things that set MT adhesive vinyl printer apart from the rest. Or that we use one of the greenest ink solutions out there? Take a few minutes to discover why MT vinyl printer is number one in vinyl printing. Digital adhesive Vinyl banners printing are one way in which tradeshow organizers and advertisement agencies publicize promotions and events. Vinyl banners can be prints by vinyl printer as large or as small as needed to grab the attention of customers and clients. Made from vinyl, these Vinyl banners can withstand several forms of weather conditions including sever weather. Many times, event organizers supplement digital vinyl banners printing with other forms of promotional materials, including, but not limited to digital posters printing, digital light boxes printing, or even wrapped vehicles printing. New forms of digital vinyl printer have been developed in recent years, which are easier to handle and install than the vinyl printer used in previous years. Vinyl today comes either as a self-adhesive or an easy-to-use pressure sensitive adhesive, doing away with the old type of adhesives, which were chemical compounds that were used in the past that could cause health problems to the user. 1. Flex Banner Printers equipped with Xaar1201or Epson DX5 printhead or Ricoh Gen5 printhead, Standard printing with double heads to meet the demand of high resolution and faster speed (Max. four printhead). 2. Adhesive Vinyl Printers through different quality tests, which is stable and competent enough for mass production requirement. 3. Flex Banner Printers equipped with intelligent infrared heater and fan drying system. 4. The LED UV printing system is optional; you may upgrade Adhesive Vinyl Printers to a LED Roll-To-Roll UV Printer once demanded. 5. Flex Banner Printers adopt Aluminum-Alloy girder, which is the most strongest and smoothest than other metal materials, which ensure high precision printing quality. 6. 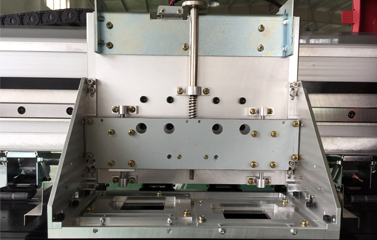 As a top quality Adhesive Vinyl Printers adopt THK 20mm width linear guide rails with double-slider and sound off function, more durable and reliable for high precision printing. 7. Flex Banner Printers own strong heavy-duty machine body (double stands and feet composite without any shake during printing) ensures stable printing and long time working. 8. We provide automatic feed in and take up system for Adhesive Vinyl Printers, especially adopt all-aluminum dual power take up system to carry and collect the whole weight of media more stably and easily. Professional soft film collecting and feeding system is optional too. 9. Flex Banner Printers equipped with intelligent media sensor that always tests media before media is going to running out. 10. Anti-collision system was also equipped on Adhesive Vinyl Printers. When the sensor installed on the both sides of the carriage, which automatic detect any force on the carriage way going, the carriage will initiate an immediate stop to protect the printheads from unexpected damage. 11. 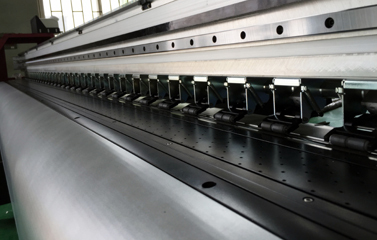 Automatic capping system is easy operation and maintenance for Flex Banner Printers. 12. Bulk ink supply system is standard option for this Adhesive Vinyl Printers, which is setting on the top of printer, easy to monitor ink level and easy ink refill. 13. Flex Banner Printers adopt USB 2.0 interface control system that get better large data transfer and anti-signal interference. Otherwise, it is also supporting windows7/64bit system. 14. Adhesive Vinyl Printers adopt metal optical cable, which connects from mainboard to carriage board to make sure fast and stable data transit. 15. Flex Banner Printers equipped with two original Leadshine Motor Control, which provide more stable quality and better efficiency during printing. 16. Adhesive Vinyl Printers adopt new variable size droplet technology, six or more variable droplet printing size provide the highest printing resolution up to 2880dpi. 17. Flex Banner Printers benefit from VSDT technology, the smallest droplet can reach to 1.5pl and the maximum can reach to 27pl, which presenting perfect printing quality. 18. As the top quality Adhesive Vinyl Printers in China also adopt widened 65mm Multi-touch pinch roller system instead of 40mm pinch roller, which is 25mm wider than normal pinch roller. This 65mm pinch roller system can provides excellent control of media feeding; ensure high precision of large format eco solvent printing. 19. 3.2m Flex Banner Printers standard equipped with two types of feed in & take up system for choice. One is heavy-duty feeding & collecting system, used for printing one whole 3.2m roll of material, especially for printing outdoor flex banner with high precision; the other is light-duty feeding & collecting system, which can print two rolls of material at the same time. You can choose one roll of 1.52m and another roll 1.27m or double roll of 1.27m for same time printing. The two systems can be switched through push-pull easily, both with auto deviation-rectifying device, ensuring wide format printing high precision.